Our original charter from 1910. A letter written in August of 1994 regarding past Scoutmaster Roscoe Masonheimer. I just got a phone call. 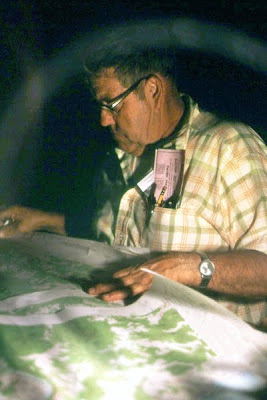 My Scoutmaster, Roscoe Masonheimer, has just passed away. 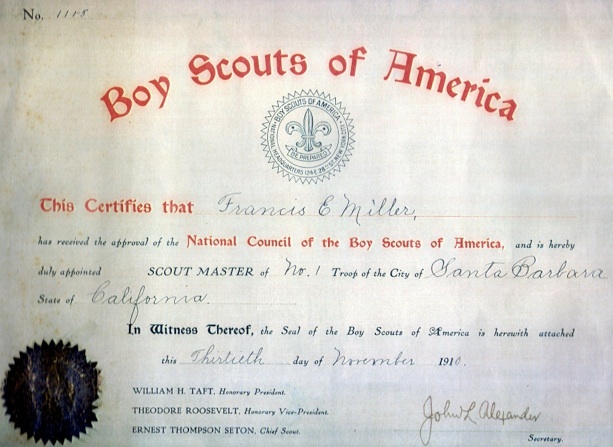 Roscoe was Scoutmaster of BSA troop #1 in Santa Barbara, Calif. for over 50 years. To say that he loved Scouting would be a gross understatement. Roscoe WAS Scouting, in the truest sense of the word. 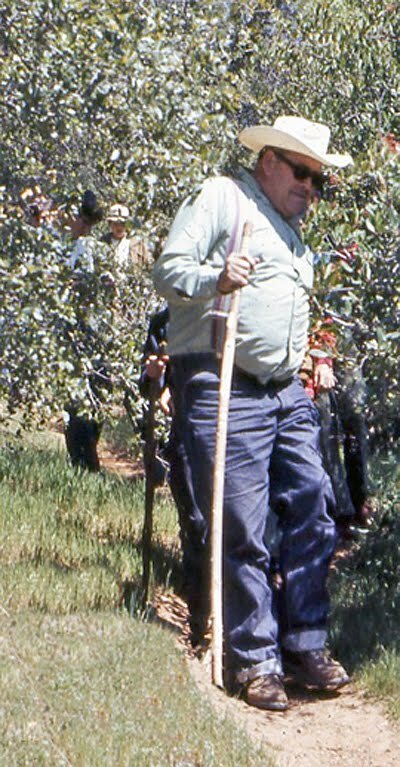 In the turbulent 1960’s, while I was in Scouting, Troop 1, Mission Council, Santa Barbara, Calif. was a haven for all that was wrong in the world. At that time Troop 1 had about 50 boys, many of whom I still know to this day. Roscoe had that unique ability to really know and to love every boy in his unit. Roscoe wasn’t only Scoutmaster, he was father, counselor, mediator, and hero. I didn’t know a boy in the Troop that didn’t want to be just like Roscoe. Yes, Roscoe taught us knots and lashings and first aid. But in a larger sense, he taught us to be men, not just men, but honorable men. When we learned a requirement, it wasn’t just to pass a test, it was to grow in our life’s purpose. Roscoe wanted us all to succeed, not just for him, but for our own self respect. To this day, 28 years after passing my pioneering merit badge, I can still splice a rope, and this is not something I use in my office everyday. In a time period when drugs were becoming a major problem, I can still remember the only problem we had in my 7 years as a Scout. On a 5 day spring trip, one of the Scouts threw away a sandwich. Roscoe privately asked each Scout if he had thrown it away, each in turn denied any knowledge of it. I still remember the hurt in Roscoe’s eyes. It was the first time, and only time that I know of that one of his boys had lied to him, it crushed him. In the late 60’s and early 70’s troop 1 was an interesting dichotomy, we had boys from the wealthiest families in town, and boys from the poorest parts of town. But when you entered that door, we were all Scouts. If your family couldn’t afford a uniform, Roscoe made sure you got one. We were a camping troop, and if you didn’t have the equipment, a way was always found for you to earn it or borrow it. Roscoe was not a wealthy man in dollars, yet every year, he spent his vacation time leading us on a high sierra trip, a canoe trip, or the most exciting thing possible, attending a national jamboree as a unit. Every year Troop 1 had (and still does) a Christmas tree lot. Every boy was expected to work the lot to earn points toward going on the BIG summer trip. The funny thing was, you couldn’t keep us away from the lot. Roscoe was a carpenter by trade. He was a product of the CCC camps of the 1930’s. Roscoe was one of those people that never quit until the job was done, and he instilled that in his boys. Much of what I am today, I owe to Roscoe. Several times in the past couple of years, my wife told me I should write him and tell him how much he had given me. Unfortunately, I was just getting to it this week, and now it’s too late. The funeral is Wednesday at 11:00 am, just about the time my wife is due to deliver our first son. If my son turn out to be half the man that Roscoe wanted his boys to be, I will be a proud father.